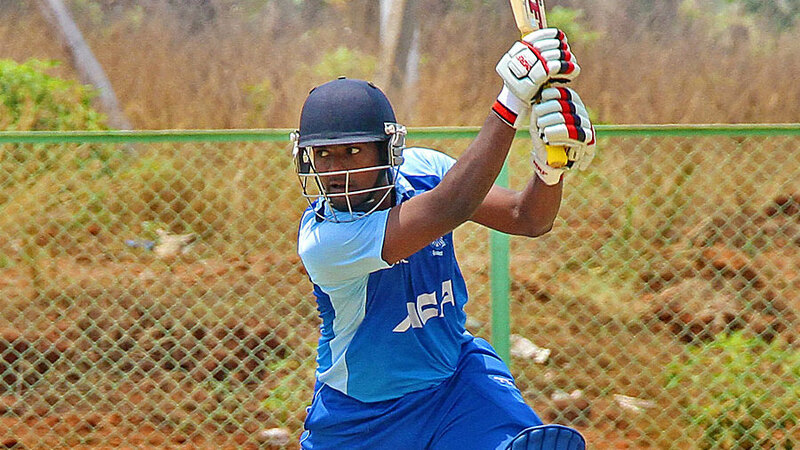 Prasanth Kumar put in a an all-round show, picking up 2 for 39 and then scoring 51 to help Andhra to a six wicket win over Himachal Pradesh in Bhubaneshwar. Put in by Andhra, Himachal managed 122 from their 20 overs. Only three batsman managed double-digit scores as they were helped mainly by Prashant Chopra's 43 and Rishi Dhawan's 37. Cheepurapalli Stephen snared 2 for 14 and Bandaru Ayyappa had figures of 2 for 19 . Andhra's reply started with a 42-run opening stand, which was broken with the fall of AG Pradeep's wicket. Prasanth then compiled 65 with Ashwin Hebbar but fell to Rahul Singh soon after reaching his fifty. Rahul also dismissed the captain Mohammed Kaif for 6, and Akshay Chauhan got rid of Ricky Bhui for 1, but Hebbar remained unbeaten on 44 and saw his side home with four balls to spare. Gujarat beat Jharkand by six wickets in a low-scoring game in Bhubaneshwar in which only five batsmen from both sides put together managed double figure scores. Put in, Jharkand lost Shiv Gautam on the fifth ball of the first over. Jasprit Bumrah then dismissed Virat Singh for 4, leaving them at 10 for 2. Ishank Jaggi and Ishan Kisan were soon dismissed by Rohit Dahiya putting Jharkand on 31 for 4. Dahiya ended with figures of 3 for 7. Jharkand couldn't arrest the fall of wickets as Jasprit Bumrah, Rush Kalaria and Jesal Karia picked up two wickets each as Jharkand's innings folded in for a paltry 78 in 19.2 overs. Vikash Kumar picked up two wickets to reduce Gujarat to 25 for 2 inside four overs a 19-run stand between Smit Patel and Rujul Bhatt before Bhatt was bowled by Rituraj Singh leaving Gujarat at 44 for 3. They lost one more wicket before an unbeaten 29-run fifth wicket stand between Chirag Gandhi and Himalaya Barad saw them over the line with 46 balls to spare. Mandeep Singh starred with the bat in a tense 147-run chase for Punjab as they beat Hyderabad by 1 wicket in Cuttack. Put in to bat, Hyderabad made 146 for 5 in their 20 overs. Tirumalasetti Suman and Tanmay Agarwal put on a 60-run opening stand before Taruwar Kohli picked up Suman for 31 off the last ball of the ninth over. Two balls later, Kaul had Agarwal caught for 22. Andhra lost three more wickets and managed 50 runs in the final five overs. Punjab began their chase briskly making 23 in 2.5 overs before Ravi Kiran had Jaskaranveer Singh caught behind for 7 on the final ball of the third over. Off his next ball - at the start of the fifth over - the bowler got rid of Manan Vohra, leaving Punjab at 30 for 2. Inder Singh and Mandeep added 44 for the third wicket as Punjab went past 50 before the partnership was broken by Akash Bhandari in the 11th over. They soon slid from 114 for 3 to 144 for 9, and Mandeep was one of the batsmen to fall after making 63 off 43 balls, with eight fours and a six. Chama Milind did most of the damage taking 4 for 24, including the wickets of Brainder Sran and Gurinder Singh off the first two balls of the final over. Punjab needed only two runs to win at the start of the over and they secured a win off the third ball of the final over. Debutant left-arm spinner Shesdeep Patra picked up 5 for 18 in three overs to help Odisha beat Mumbai by 17 runs in a 15-over-a-side game in Cuttack. Chasing 126, Mumbai lost two wickets in the first over - of Akhil Herwadkar and Jay Bista for ducks - to Deepak Behera, leaving the score at 1 for 2. Shoaib Shaikh (34) was then part of two 30-plus partnerships which steadied the innings, until Patra struck. He picked three wickets in the 12th over, of Shoaib, Abhishekh Raut and Rohan Raje, reducing them to 85 for 7. Patra then ran through the middle and lower order, as Mumbai were bowled out for 108 in 14.4 overs. Behera finished with 2 for 9 from two overs. Earlier, Odisha chose to bat and raced to 33 in 3.3 overs before Akash Parkar broke the opening stand. Odisha, however, didn't lose momentum and Govinda Podder added 48 with Roshan Kumar Rao before Podder fell in the 10th over, leaving Odisha at 81 for 2. They then lost three wickets within a space of six balls. Raut dismissed Arabind Singh in the 12th over, then Rao was run-out by Herwadkar four balls later, for a 34-ball 48, and Raje then cleaned up Biplab Samantaray to leave Odisha at 95 for 5. Raje picked up two more wickets as Suryakant Pradhan made a seven-ball 20 to help Odisha to 125 for 8.